Lemons…yes I am going to post again about lemons! I’m going to let you into the secret of the best lemon cake ever according to all those that have tasted it – the Lemon Tipple Cake. 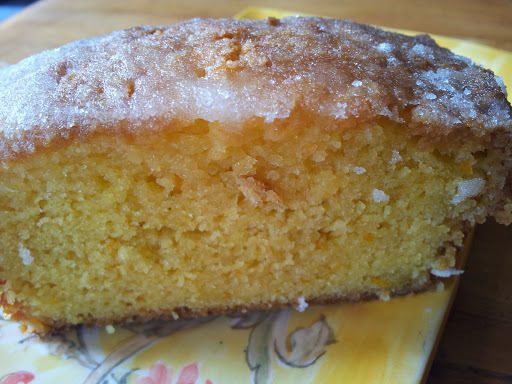 It’s a mix of two recipes from two of my favourite cooks; Hugh Fearnley-Whittingstall’s Lemon Trickle Cake and Lois Daish’s Lemon Pound Cake with Gin Syrup. 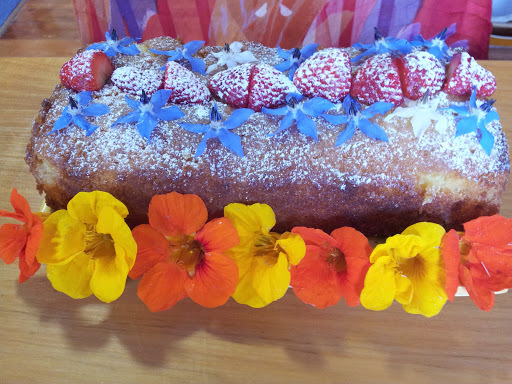 From Hugh I use the cake recipe as it’s a light Victorian sponge and I use Lois’s Gin Syrup as the topping because this little tipple makes the cake so delightful. I have taken the liberty of naming the cake the Lemon Tipple Cake. This recipe is made in a loaf tin and the lightness of the cake will depend on the quality and quantity of beating. You can do it by hand but for this cake I prefer to let Ken Wood do the hard work. Use Ken at full speed to whip the butter and sugar, then add the eggs one at a time. To avoid curdling add 1 Tbsp of the measured flour after the addition of each egg..and it helps if the eggs are at room temperature. The butter, sugar and eggs should be beaten until light in colour as above. This is what makes the cake light. Grease and line a 1 litre capacity loaf tin with baking paper. 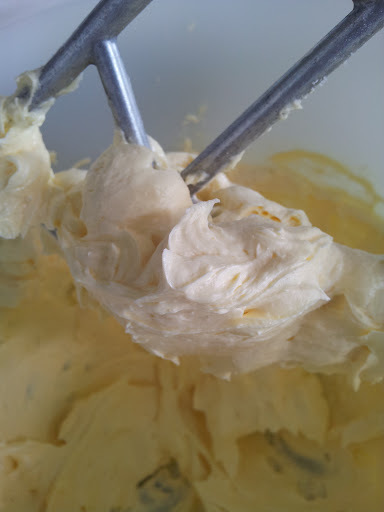 Cream butter and sugar until very pale and fluffy (at least 5 or up to10 minutes if you can manage it). Add the grated lemon zest and then beat in the eggs one at time, adding a spoonful of the measured flour to avoid curdling. Sift the remaining flour and salt into the mixture and fold in lightly using a large metal spoon. Add a little milk if necessary, to achieve a good dropping consistency – i.e. the mix should drop fairly easily off a spoon when you tap it on the side of the bowl. Spoon mix into tin, smooth the top gently and put in preheated 170 degrees C oven. Bake 45-50 mins or until skewer comes out clean. With the skewer make holes all over the cake going quite deep but not hitting the bottom. 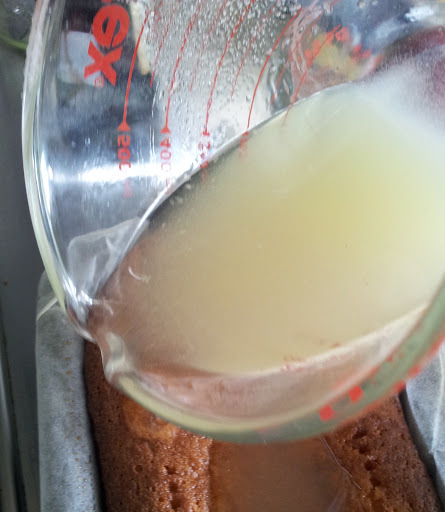 Spoon or slowly pour over the hot lemon cake so that the holes can fill up. 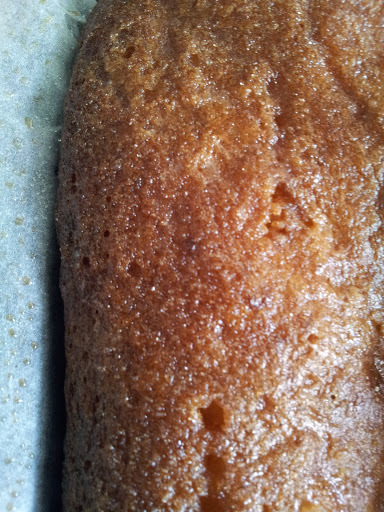 The surface of the cake once the syrup has soaked in. It’s a moist yet a light cake. Does it keep? Well in my experience it’s the sort of cake that doesn’t get the chance to hang around. I have had the fortune of having a piece the next day and it was still as good as the day before. …On the other hand, compost usually does need to hang around for months before it can be used in the garden, but not with the system I have rediscovered. Living in urban Auckland, space is limited for processing compost, but I still want to make compost for the benefit of my plants in my newly established raised bed. at the ready with gardening gloves. Auckland’s daily summer temperatures of around 25 degrees give me an incentive to find ways of dealing with food scraps quickly, so as to avoid them mouldering away in smelly bins. Luckily I had packed my Bokashi bucket when I left Dunedin. Bokashi comes into its own up here. It’s a system of composting that originated in Japan and means “fermentation”. 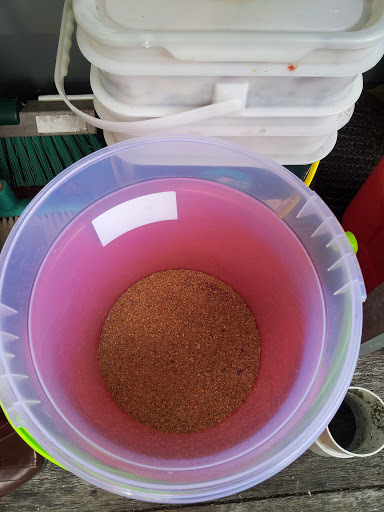 One of the best things is after fermenting for 10 days you can give it a shallow burial in the garden and in summer after another 10 days you can begin planting in that soil. Not one of my more attractive pictures! But I wanted to show you what it looks like after being filled over 3 weeks. 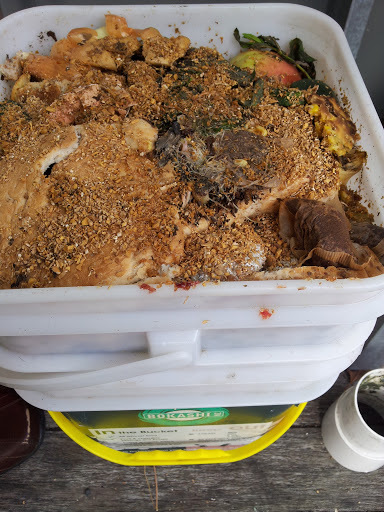 The environment in the bucket has to be anaerobic (the food is squashed down to squeeze out any air) which usually means in composting terms that it should smell really bad. But it has an almost sweet fermentation smell about it, rather like it’s being pickled. 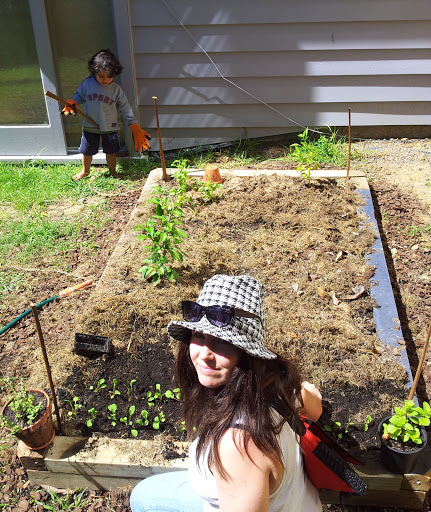 The juice adds nutrients and good micro-organisms to your garden. It must be diluted 100:1 (i.e. 2 Tbsp to 5 litres of water) to apply to bare soil. For foliage dilute to between 1:500 to 1:1000 (1-2 tsp) to 5 litres of water and spray over foliage to form a film over the leaves. Juice that gathers in the bottom bucket should be used every 2 days. The juice indicates how successful your fermentation is. It should be a light brown, not smell too pungent and could have a light white mould on top as above. 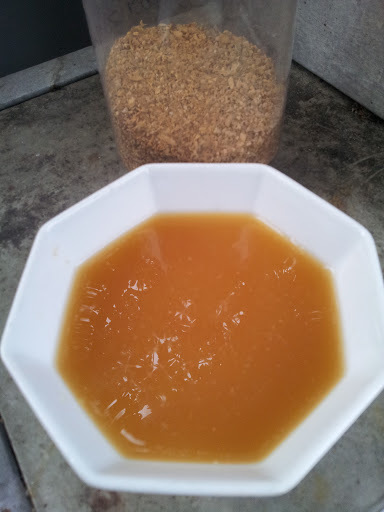 The fermentation happens because the sweet smelling bran called Zing has been impregnated with good bacteria. Add a good handful (more in summer or if you have larger quantities of protein to break down) each time you add food scraps. It’s best to collect the scraps into a container and add when full – a 2 litre ice cream container is ideal. Cut up the material to fit more in the bucket and to hasten the composting process. Once filled up you leave the bucket closed for two weeks. I thought I would let The Guardian’s columnist Alys Fowler tell you about the next stage…. The only no no is to put liquids into the buckets and its important to press down the food after each addition to squeeze out the air. This is something I am keen to try as I intend on growing things in containers. To set yourself up with a Bokashi bucket and zing it costs around $50-$55. I now need a second bucket while my other one is fermenting. I want to see if there is a cheaper way of doing it. My first homemade attempt at making my own Bokashi Bucket. Ideally the buckets should be the same size. Mine aren’t but I do like the colours! 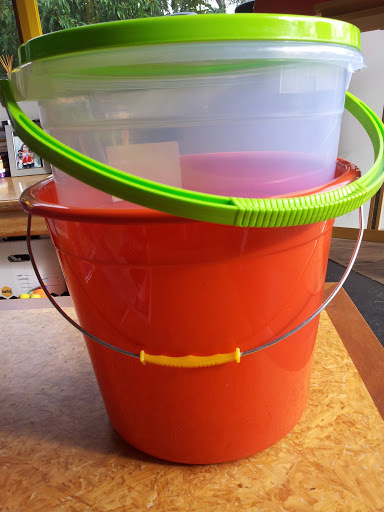 I have managed with one bucket with a good fitting lid and drilled holes in the bottom and put it together with a cheaper bucket for holding the juice. They seem to be working. When first using the bucket put a good handful of Zing in the bottom. The original ZingBokashi bucket is in the background. But I could do better and am on the look out for some buckets that are larger and stronger and I have a lead… kitchens have lots of buckets with lids and the best thing about this lead is that the plastic will be safe for food. As Ponsonby Road has lots of kitchens, I will be doing the rounds! 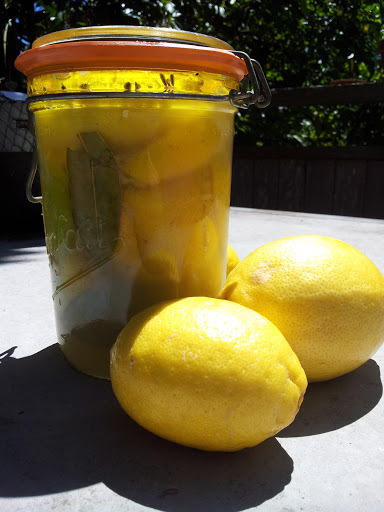 In my previous posting I talked about preserving lemons. I found my lemons and squeezed as many as I could into this lovely French glass jar I got for free from a second hand store. I am now prepared for when lemons become scarce. Next weekend I am lucky enough to be invited by friends to go sailing on the Hauraki Gulf. 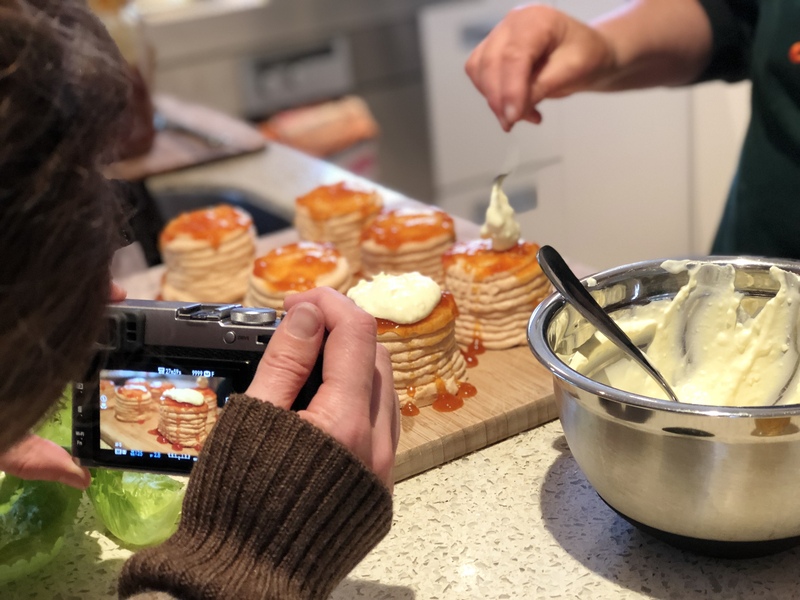 I will be taking a Lemon Tipple Cake because I imagine any cooking on board will be difficult because of limited space…or will it?